I love DUAL SCREEN ! IFSCL development never been so cool ! Firstly : some months/half a year isn't long ! As you know, I'm working alone on the game (not talking about translations and beta, thanks to the contributors) and I work better that way. But I still have studies, work and hopefully, a life. I'm still a big fan of the original show and hope fans will stay for the IFSCL, even with C.L.E coming to our screens soon, in France. What should you expect for this version ? 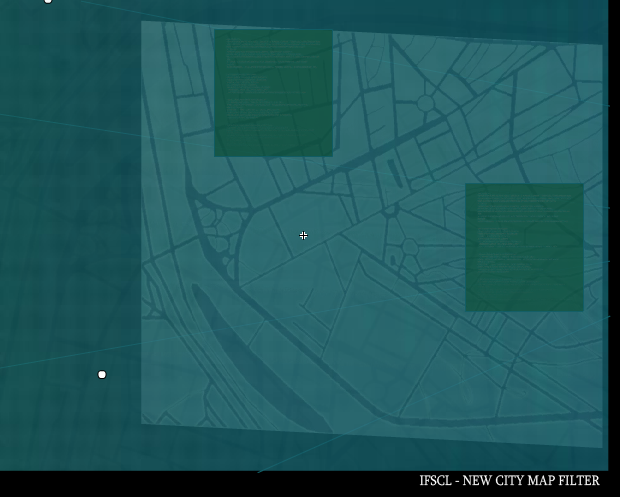 first : As always, READ IFSCL Improvements list for the next version here. Constantly updated with stuff that is ready for the next version. A lot of stuff that must be polished. A big correction on pretty everything that was still buggy. I created a windows that contains most of the ADN programs that appears in the show, sometimes they appear in the transition windows (I mean, in the animated show), sometimes not so I decided to create a dedicated windows, which contains all those stuff. Still in progress. And I think I will do at least one more mission to introduce some of the already-added programs. I had bigger plans for this version but I think I won't add other stuff and release this version sooner, and doing again an other after before starting Carthagesque-stuff, so you will have less time without nothing new to touch.. So it's plenty of stuff that must be ready in the same time, this will be better If I do not release that now, there is too much work to release Franz Hopper stuff so soon. Oh by the way, this coming version or the next one won't need Adobe Air Installation, the program will be directly packed into the IFSCL installer. Don't know, as always, when I can tell it, I tell it, and it's really written everywhere, you can't miss it. I might do a Beta Test, same thing, if I do one, you will see it easily. But as I say above, I had reduce my expectations for that coming version (I've kind of splitted it). So I still think It might be released sooner, again before 2013, but can still be released at Christmas ! My PERSONAL goal is to release a version before the end of my holidays (end of September), but it's not a promess for you. About William : It will be available for LyokoWarrior's Side and Xana's Side, in his two costumes, and again, it will only be available when all the things that appear in the show before his first appearance on lyoko will be done. Gimme a Version Number ! Still don't know ! Something between 2.0.3 and 2.1.7 I think. Will be said when updates will all be added. Some fans asks me about what did I think of upcoming Code Lyoko Evolution show, and will I do an other interface on it or add some of functionalities into the IFSCL from CLE. I won't touch C.L.E. I like it. By the way, I hear this fault everywhere so remember : it's not a season 5 ! It's a brand new show, taking elements from the back-story but you should think about that as a sequel, a remake if you want, but It's definitely not a "season five", there is a reason why there is a 'evolution" in the name. So you've got plenty of stuff you can do that I won't do. I'm really talking to people who tries starting fan-interface of the supercomputer. Cela va télécharger et vous ouvrir le menu d'installation d'adobe AIR. Suivez les instructions du logiciel. Cela télécharger puis vous ouvre le menu d'Adobe AIR qui permet d'installer une nouvelle application. Vous aurez juste à remonter l'arborescence de votre disque pour aller dans votre répertoire personnel et sélectionner le fichier IFSCL_2.0.0.c.air . Normalement l'installation s'est déroulée correctement, vous pouvez donc supprimer les deux fichiers IFSCL_2.0.0.c.air et AdobeAIRInstaller.exe qui sont dans votre répertoire personnel sans risque. Pour lancer l'IFSCL, passez par le menu de Wine : Applications > Wine > Programmes > Paradoxe Upsilon Creation > IFSCL. Yay thanks much cant wait!!!!! The skid will come in a long long time ! You should understand that this is long and intensive work. I know you've said this before but, Please implement a delayed virtulization! It would be a great addition to the already Fantastic program!